Upgrade now get an activation license key immediately! If you have questions about ordering or payment, please email our reseller. * Prices shown in USD will be converted to your own currency during the order. Prices exclude EU VAT, which will be shown in the order page, if applicable. Note. The "name" part may also be your real name or company name. Use this key to register DreamCalc by clicking "Help→Activate License Key" from the main menu. You will be prompted with the key entry window (see right). 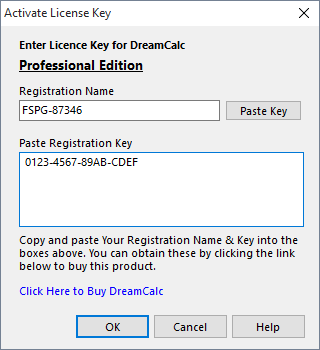 Copy and paste your license Name and Key strings into the corresponding boxes and click OK.
Once DreamCalc accepts your License Key, all reminder messages will be disabled permanently and all restrictions unlocked. Your software will now be registered. IMPORTANT: Make sure you keep a backup copy of your key for when you need to re-install the software. IMPORTANT. DreamCalc is licensed on a per user basis, and the prices above refer to a single user license. If you wish to run DreamCalc in a commercial environment with multiple users, you MUST purchase a sufficient number of licenses. Discounts are available on all volume purchases — the unit cost decreases with the quantity ordered. Campus licenses are also available to educational institutions.